On Dec 6 2010, the VPD and the City announced the Project Sister Watch, a program aimed at promoting the safety of women in the Downtown Eastside. While the Sister Watch news story has made it onto other 2010 “top ten” lists, its significance as part of a larger movement for justice for missing and murdered indigenous women may have been missed by many. It is important to tell the story of how this program also owes its existence to community activism in the Downtown Eastside. On Sept 15 2010, Ashley Machisknic, a 22-year old Indigenous woman was found dead in an alley behind the Regent Hotel in the Downtown Eastside. Community members, believing that Machisknic had been murdered, petitioned the Vancouver Police Department (VPD) to investigate the death, but the VPD did not respond. 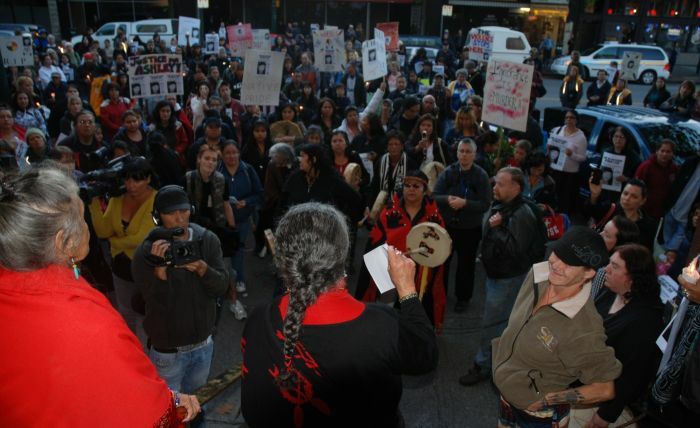 On Oct 4th 2010, the National Day of Action for Missing and Murdered Indigenous Women, a community vigil was held behind the Regent Hotel. The vigil participants then marched to VPD’s Main Street headquarters, requesting to speak with Police Chief Jim Chu about their petitions. A delegation of women entered the police station, declaring they would not leave until Chief Chu agreed to investigate Machisknic’s death, and to work with the DTES community develop pro-active measures to stop violence against women. A crowd of over 100, rallying outside the police station for several hours, was periodically updated on the status of the negotiations inside. Then, without warning, three of the delegates were forcibly arrested and the others (mostly elders) were expelled from the police station. The crowd, saddened but determined, expressed solidarity with the arrestees, and vowed fresh rounds of non-violent civil disobedience should police fail to investigate the cases of missing and murdered sisters in the future. The arrestees, who were released without charges the next morning, made it clear that this action in the Downtown Eastside (“ground zero when it comes to violence against women”) was part of a larger movement to end violence against aboriginal women. Although slow to respond, the VPD agreed to investigate Machisknic’s death, and announced on Dec 6 that they would reorganize Project Guardian and rebrand it as Project Sister Watch, in accordance with the requests of the Women’s Memorial March Committee (see articles: Sun, TheProvince, 24Hours, TheStraight). As imperfect as they are, these milestones represent progress. Credit where credit it due: there would have been no progress at all without pressure from the grassroots. And so 2010 was the year we took large steps toward justice for missing and murdered women. Posted in Downtown Eastside, Features, Police, Reviews. Bookmark the permalink.